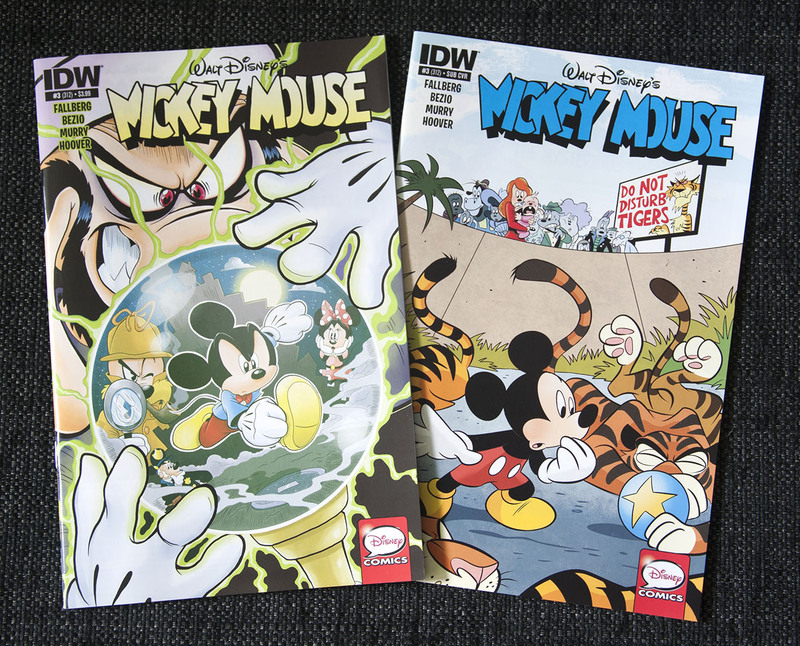 I just picked up Mickey Mouse #312 (IDW’s #3). And this time it features one of a series of stories I’ve been waiting for a long time! After decades of simple gag strips in the daily newspapers, they finally started making serialized Mickey Mouse stories again in the early 90’s. 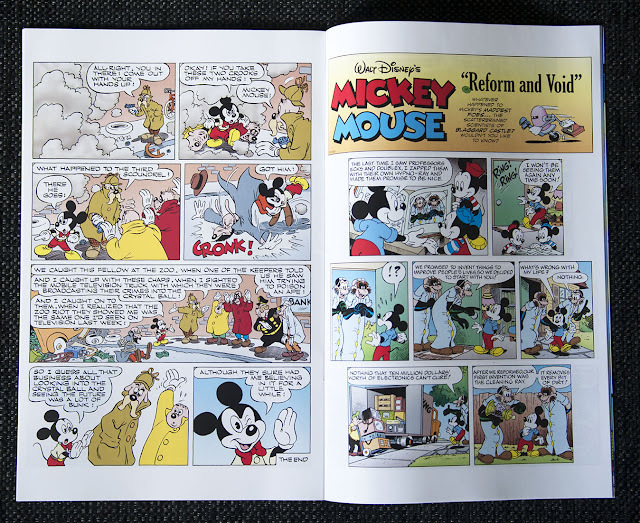 A few are remakes of old Gottfredson stories, but most are new originals. Equal for all is that they are really hard to find! Most are not reprinted in any comic books, at least not in English, and even in the newspapers they are a rare find. I've read most of them as bad newspaper scans found in online newspaper archives, but I’ve been waiting a long time for proper high quality reprint in a comic book. 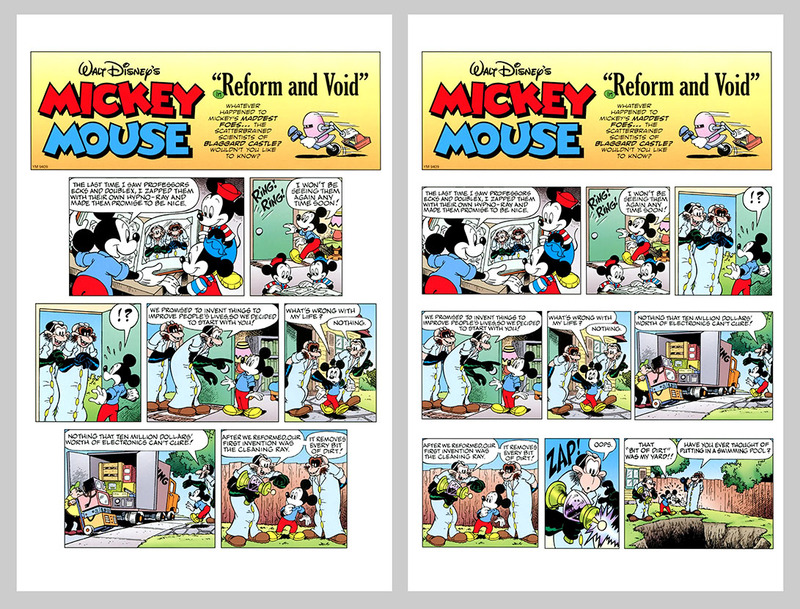 And even if I prefer reading the 30’s and 40’s Gottfredson serials in black and white, the ones from the 90’s looks a lot better colored I think. One of these stories are printed in Mickey Mouse #312. 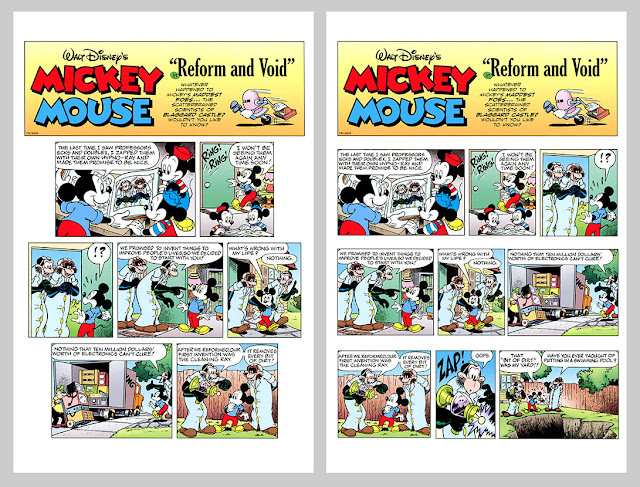 It’s titled "Reform and Void" and were originally serialized in the newspapers from December 26, 1994 to January 14, 1995. The story starts with Mickey making a reference to when he used the hypnotic ray on Ecks and Doublex (and Triplex) in "Blaggard Castle". Here is that scene as seen in the original (daily strip December 1, 1933), the remake (daily strip February 15, 1994) and in a summary story in a 1993 Nabisco giveaway. As in "Reform and Void" Professor Triplex does not appear in the 1994 remake of "Blaggard Castle". So.. what are the reformed professors up to in this new story? Well, I’m not going to spoil the entire story in this blog post, so you should go get a copy of Mickey Mouse #312 :) And if you are unfamiliar with the mad professors, go get the Floyd Gottredson Library vol.2 from Fantagraphics too. That’s a series of books I can highly recommend! To the lef: How IDW did the layout. To the right: How I'd prefer it was done. To the left: The original panel. To the right: IDW's edit. The setting of "Reform and Void" is a bit inconsistent with the other sequel to "Blaggard Castle". 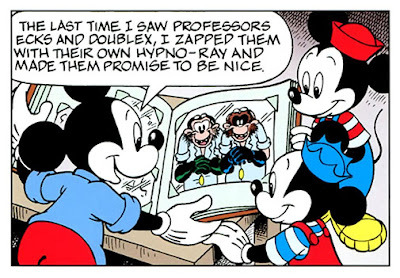 In "The Perils of Mickey" printed over several Disney Adventures magazines in 1993 and reprinted in the Floyd Gottfredson Library vol 2., the Phantom Blot has a slightly different story about what happened to the professors. 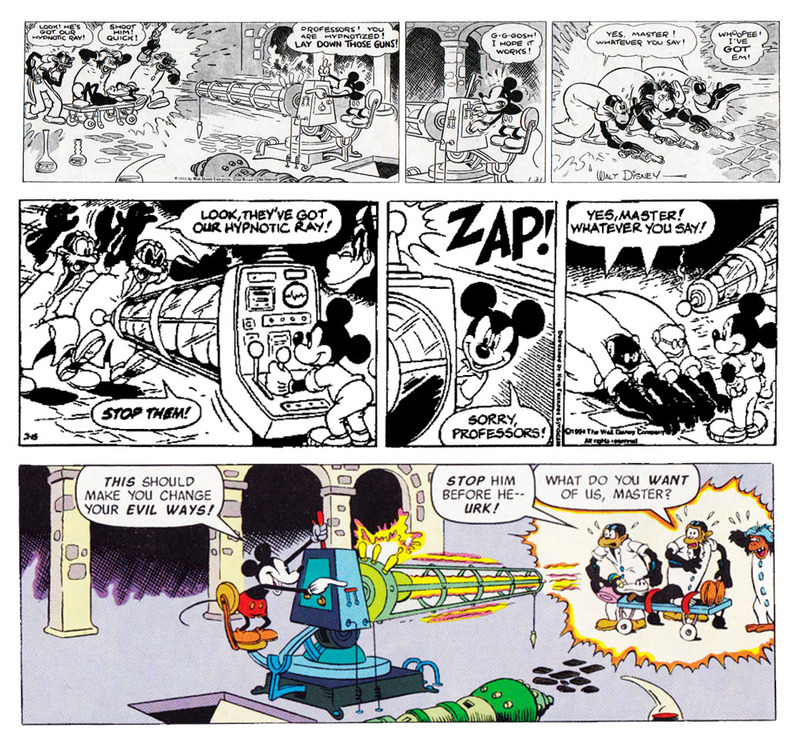 Ecks, Doublex and Triplex are not widely used in Dinsey comcis, and Gottfredson only used them once. Most of the (few) Egmont stories that features the professors already got printed in the USA by Gemstone, but a couple are still only printed in Europe. 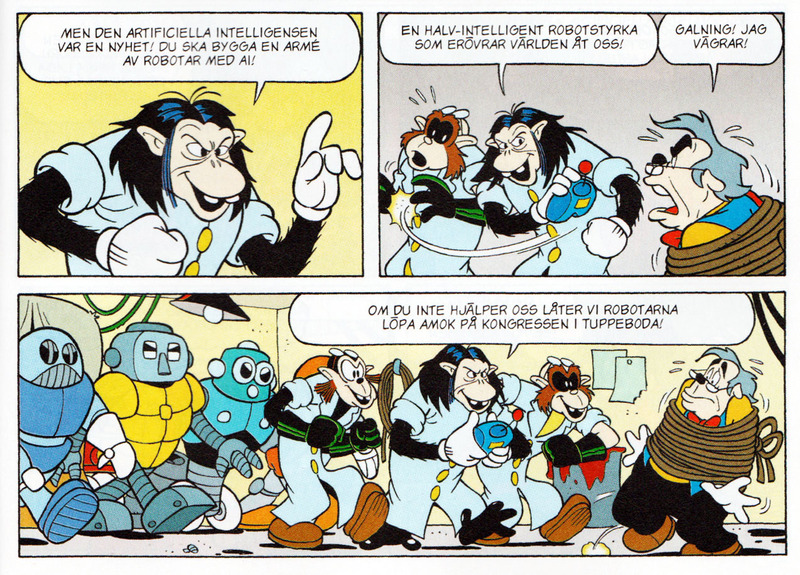 Here is a sample from the last one printed in Europe, where the professors kidnap Doc Static in a plot to make a robot army. One of the other rare newspaper serials from the 90’s features Doctor Doublecross, as seen in “The Riddle of the Runaway Sphinx” (Mickey Mouse Adventures #2, 1990). I really hope we get to see this one and some of the other Mickey serials from the 90’s in future IDW issues!